For the past two weeks, I’ve been reviewing, in chronological order, some of the most and least memorable melodramas ever filmed. We started way back in 1916 and now, after 52 reviews, we’ve finally reached the year 2004. And that can only mean that it is time to review the worst film to ever win an Oscar for best picture of the year. I am, of course, talking about Crash. Crash is an ensemble piece that follows a multi-racial cast of characters as they deal with issues of race, crime, and — well, that’s about it. In Crash, everyone’s life revolves around race and crime. Well, I take that back, There is at least one character whose life revolves around being a good maid to the white woman who employs her. But otherwise, it’s all about race and crime. The film is set in Los Angeles which, from what I’ve read, is actually a pretty big city but you really wouldn’t know that from watching Crash. All of the characters in Crash are constantly and randomly running into each other. I think director/screenwriter Paul Haggis is trying to make a statement about the power that coincidence plays in the world but, often times, it just feels like lazy plotting. Brendan Fraser and Sandra Bullock play rich white people Rick and Jean Cabot. Rick Cabot has just been elected District Attorney of Los Angeles County. (Because when I think of a successful urban politician, I automatically think of Brendan Fraser…) Jean is his materialistic wife. At the start of the film, they’re carjacked by two young black men, which leads to Jean suspecting that every non-white she sees is secretly a gang member. Later, Jean falls down a flight of stairs but she’s helped by her maid, who happens to be — surprise, surprise — not white! Apparently, this teaches Jean an important lesson about tolerance. The message, I guess, is that white people can be redeemed by interacting with their minority servants. 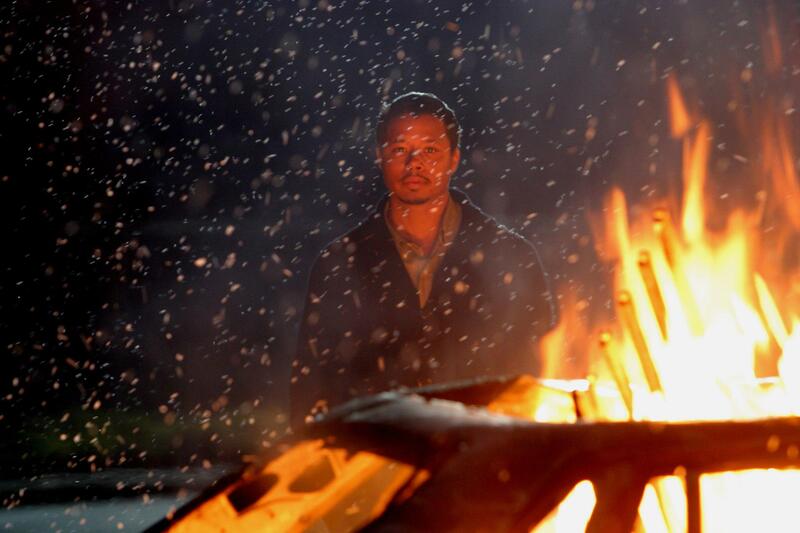 And then there’s Cameron (Terrence Howard) and his wife Christine (Thandie Newton) who are upper class and black. Cameron directs sitcoms for a living and, at work, he has to deal with Fred (Tony Danza) constantly double guessing him and demanding that he reshoot scenes. One night, as they leave an awards ceremony, Cameron and Christine are pulled over by two white cops — the racist Ryan (Matt Dillon) and his idealistic partner Hansen (Ryan Phillippe). Ryan proceeds to molest Christine while giving her a pat down. The next day, Christine is involved in a car accident on the freeway and is pulled from the burning car by none other than Officer Ryan. The point here, I suppose, is that the same pervert who finger rapes you one night is just as likely to be the same guy who comes across your overturned car on the freeway. For that scene alone, Crash deserves the title of worst best picture winner ever. There’s also Detective Graham Waters (Don Cheadle), who has been assigned to investigate a police corruption case that would not be out of place in an episode of … well, just insert your own generic cop show title here. Graham also visits his mentally unstable mother who demands that Graham find his younger brother. Now, of course, as soon as we hear this, we know that Graham’s brother is going to have to turn out to be one of the other characters in the film. Since there are only three other black males in this film (and since Cameron appears to be the same age as Graham), it’s not difficult to figure out who it’s going to be. It’s either going to be Anthony (Ludacris) or Peter (Larenz Tate), who also happen to be the same two men who carjacked the Cabots’ car at the start of the film. Larenz Tate probably gives the best performance in this whole sorry mess of a film, even if his role is ultimately a thankless one. There’s also a locksmith named Daniel (Michael Pena), who finds himself being stalked by an angry Middle Eastern man. Daniel’s story contains a hint of magic realism, presumably because Paul Haggis was reading something by Gabriel Garcia Marquez while writing the script. You can fault Crash for many things but you also can’t deny that it’s far more ambitious than the typical bad film. In the space of 112 minutes, Paul Haggis attempts to say everything that needs to be said about race and class in America. Unfortunately, while watching the film, it quickly becomes obvious that Haggis really doesn’t know much about race and class in America. Hence, the film becomes a collection of scenes that think they mean something while actually meaning nothing. Crash is less about race in America and more about how other movies have traditionally portrayed race in America. Unfortunately, director Haggis does not have the self-awareness to truly bring the subtext of screenwriter Haggis’s script to life. The main theme of Crash seems to be that everyone has a good side and a bad side and that you can the hero of one story while being the villain of another. That’s not a bad theme, it’s just an incredibly mundane one. The film illustrates this theme by continually having a character say something racially offensive just to then have him do something heroic in the very next scene. As a result, the characters don’t come across as being so much complex as just incredibly inconsistent. Crash is never as deep as it thinks it is. 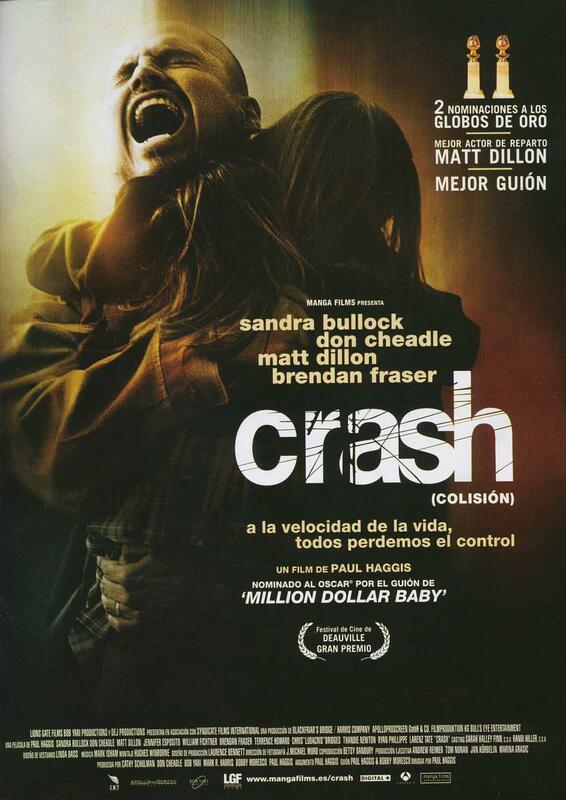 Reportedly, Crash was inspired by Paul Haggis’s own experience of getting carjacked. Haggis has said that being a victim of crime led to some intense soul searching on his part. Hopefully, Haggis got something better than just Crash out of the whole experience. This entry was posted in Film, Film Review and tagged Bahar Soomekh, Brendan Fraser, Bruce Kirby, Chris "Ludacris" Bridges, Crash, Daniel Dae Kim, Don Cheadle, Embracing The Melodrama, Film, Jennifer Esposito, Karina Arroyave, Keith David, Larenz Tate, Lisa Marie Bowman, Loretta Devine, Ludacris, Marina Sirtis, Matt Dillon, Michael Peña, movie, Nona Gaye, Oscars, Paul Haggis, review, Ryan Phillippe, Sandra Bullock, Shaun Toub, Terrence Howard, Thandie Newton, Tony Danza, William Fichtner. Bookmark the permalink. What if the disgusting Scottish “food” product Haggis were to become self-aware?